In the world of wearable art, creativity knows no bounds. 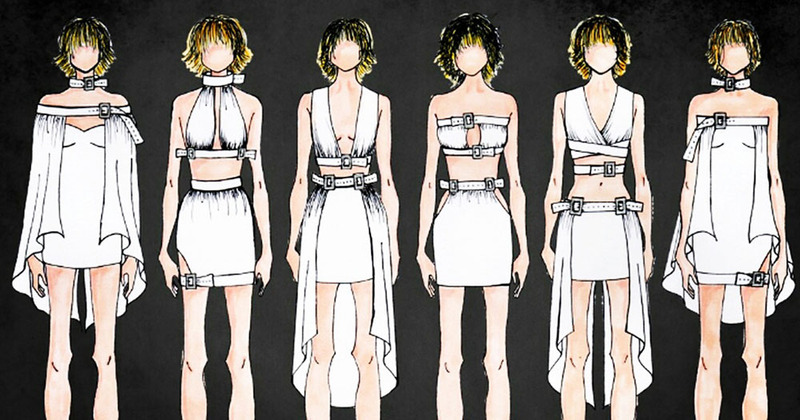 See the incredible winning designs of four Open Colleges fashion students who put their skills to use in a recent competition. Fashion and art have been flirting for hundreds of years – we see it in haute couture, in experimental runway shows by designers such as Alexander McQueen and Rick Owens, and in made-to-order pieces for the likes of Lady Gaga. But perhaps the most extreme marriage of the two disciplines is wearable art. For those unfamiliar with wearable art, it’s exactly what it sounds like. Artists create works to be displayed on the human body, in the form of clothing or jewellery, but with a concept much deeper than decoration. The artworks may be bare and harsh, melded from materials such as wire or cord, or more intricate, extravagant and costume-like. Read more about wearable art here. This year, Open Colleges fashion students were given the chance to unleash their creativity in a wearable art competition, with incredible results. Check out the work of the finalists below. Gamze’s work, made entirely of electrical cables, was dedicated to strong women in her life and inspired by images of tribal women warriors. What made you decide to enter the wearable art competition? The chance to challenge my imagination, skills and patience. I was thrilled to have the opportunity to unleash my background in visual arts and professional styling and combine it with my fashion design knowledge to create my wearable art. What did you like most about the process? The most amazing part of the process was when I took a step back from my mannequin. In front of me stood the ‘Strong Women, Cable Mentality’ garment that I had imagined, turned into sketches, constructed from 500 metres of speaker cables (which I had never dreamed of using), and created by hand while simultaneously learning the new techniques of knotting, braiding, plaiting, wrapping and weaving. For me, that moment was magical. Your design has a beautiful concept behind it. Do you create all your designs with strong women in mind? Usually in my designs I try to raise awareness of issues that need a voice. But at the concept and strategy stage I am inspired by everything – nature, culture, characters, quotes, feelings – and when people wear my designs I would like them to be able to feel and convey that inspiration, and further inspire others. What would you like to do with your design talents after finishing your Open Colleges course? 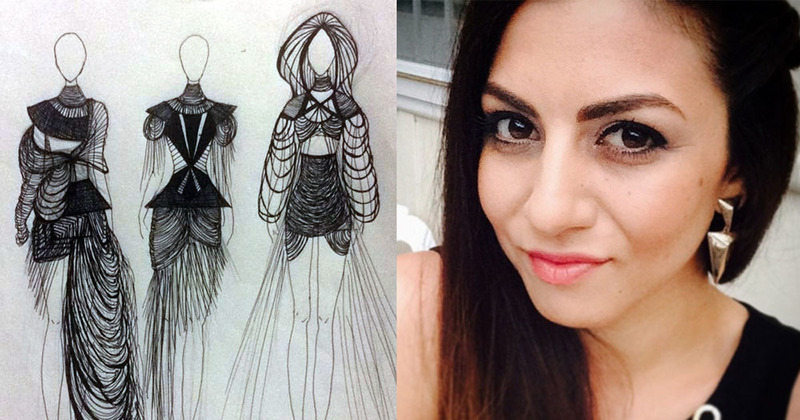 After Open Colleges, I would love to be part of the new generation of Australian fashion designers which is emerging with innovative ideas and collaborating in multimedia designs that are sure to set new heights on the world stage. 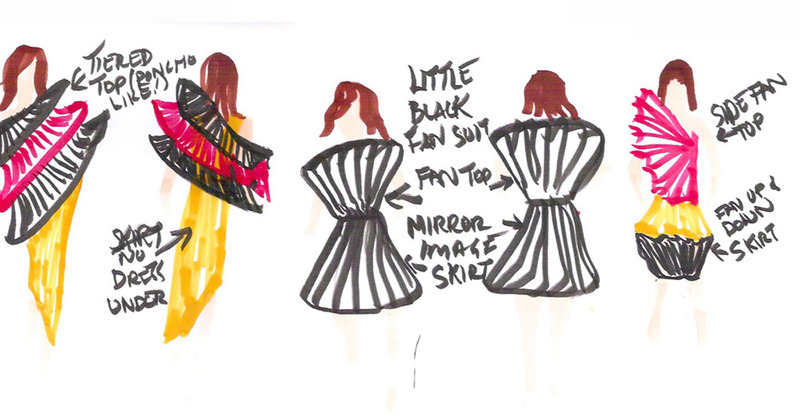 What’s your favourite part of fashion design? The whole process of fashion designing is enchanting, but the end result is the most satisfying. To see in the end that your visions, inspirations, sketches and hard work have been given life as unique garments, and to see people wearing them with their own unique style is purely priceless. Mixing elements of traditional Japanese culture and design with the art deco style of the roaring ’20s, Liz’s work draws on the pattern of a folding fan to create interesting movement and structure. I wanted to take the opportunity given by Open Colleges to express my creativity. I wanted to challenge myself beyond the assessments of the course to apply and build on my existing skills. I really liked the freedom to choose an inspiration of my own. It was such a great chance to think outside of the box and create freely, to construct something that previously only lived in my mind. Do you think designing with a theme or story in mind is something you’d like to do more? Absolutely. I became very interested in balancing the influences of my design while gaining an insight into the history and culture of Japan and art deco. I enjoy learning about how culture, environment and fantasy impacts fashion and individual style, so this was a great opportunity to delve deeper. I’d like to have a career in women’s swimwear design and create innovative pieces for individuals to express themselves. What’s your favourite part of fashion design in general? I love the freedom to create and the feeling of constructing something from my mind to 2D [drawings] and then to 3D. I think style is such a personal thing and I really love that fashion gives people an opportunity to express themselves. Nadine’s garment tells the story of overcoming struggle, of drawing on personal strength and the power of creative expression to break free of constraints. Just a month before the deadline I attended the MSFW event with the tutors and other students, and Mimma [Open Colleges’ head fashion trainer] urged me to give it a go. An idea was planted and took root. I knuckled down and got it in with minutes to spare. The thing I liked most was the emotional journey it took me on. Having a fairly open brief allowed us to let our creativity run wild. When it began my idea was slightly different, but by the end it had taken a form even I was surprised with. I think it helped with some personal healing and discovery. Do you create all your designs with themes of strength and freedom in mind? All of my creations have a piece of me in them. This powerful concept came from a personal experience and the wish to share that with others. Freedom and strength are definitely feelings I wish to spread and I’m sure my designs will continue to reflect that. When I find inspiration I’m always taken on a journey as the designer – sometimes even I don’t know the message or where I will end up until completion, which I love. My aim is to start a fashion label. I’m already building a fashion business called Dress by Design by Nadine Designs which is still in start-up mode. I have something big planned for the near future but that’s still under wraps... stay tuned! I love fashion design because it is and always has been a part of me. 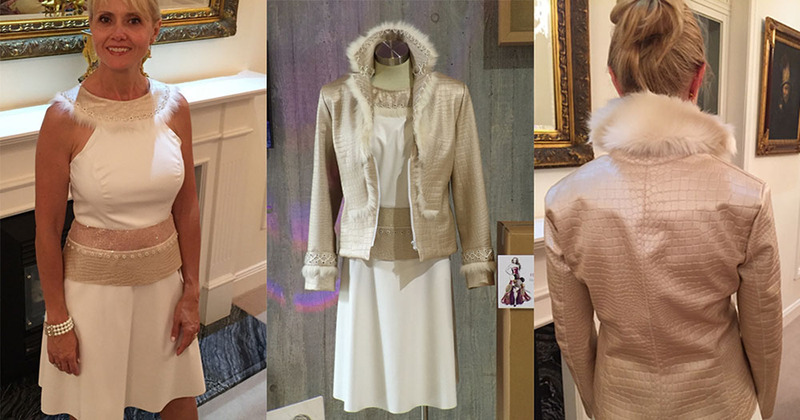 I see clothes in my mind that I could never find in stores – sometimes I even design while I dream. I’m a visual and creative person and can’t imagine not designing. Celebration, excitement, effervescence. Felicity’s work is inspired by the sophistication and pleasure associated with a flute of champagne, clear in its silhouette, luxe materials and colour palette. I entered the competition last year, and the experiences and opportunities that came from that were exciting and unexpected. This year I wanted to push myself – I wanted to prove to myself, and those interested in seeing my work, that I am studying my lifelong passion and achieving recognition. It really was an extension of the course: it put together many of the elements I’ve learned with a focus on my individual creative thought process and execution. The brief was extremely open and allowed us infinite possibilities. The only limitations were our imagination or fear of not giving it a go. What do you think are the benefits of designing a more artistic, conceptual collection, versus a more mainstream line? Last year I went all out in creativity, so this year I decided to rein it in a little and use creative design in an artistic, commercially-inspired collection that I could proudly and practically wear in public – while still being edgy enough to stand out and be commented on. No matter what I create, I am always trying to be original and interesting. Originally I started the course with the intention of gaining designing skills I didn’t have, so I could complement my sewing ability and nurture my creative soul. However, as I move further in the course, I can really see myself gaining the confidence and skills to begin a small online fashion label. Never say never, and never too old! Your favourite part of fashion design in general? So far it’s the sewing and construction, as that’s what I feel most comfortable with and have the most experience at. But going through the course, I have unlocked hidden skills. It’s been exciting to create a garment from scratch, wear it, and have others ask if it’s my design, and comment on it. It makes my day! Feeling inspired? Check out our guide to fashion careers.